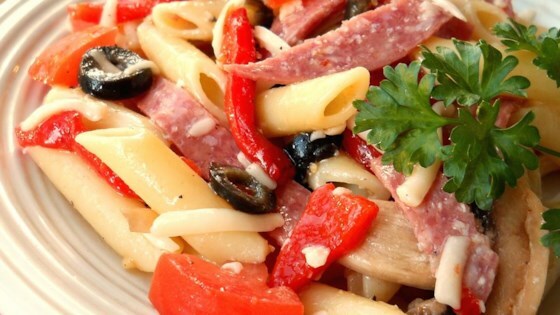 "This delicious pasta salad is always a big hit at parties and it's so easy to make. Everyone is always asking me for the recipe. Try it for yourself with the pasta of your choice." No one in my family cared for this. It made a lot. Besides the taste, it had an unappetizing brownish color due to the balsamic vinegar. Very good. Just a couple notes: 1. this makes a TON of salad. So consider yourself warned! 2. It's a very heavy salad, so I freshened it up with lots of (nearly) raw broccoli. It made it for me. A great recipe for vinegar lovers! I added some basil at the end - thought it needed just a little something more. I'm keeping this on hand and definitely making it again. Thanks Kathy!